"This is my take on an American-Mediterranean fusion. Well, we were also low in the protein area that night, so this was created. Considering the dish is a salad, it is still plenty filling and full of fresh flavors. The time spent making it is all in the prep work, then just simply assemble." Mix water and falafel mix together in a bowl; let stand for 10 minutes. Form mixture into 12 patties, about 1/2-inch thick. Fry falafel patties, working in batches, in the hot oil until golden brown and crisp, 3 to 5 minutes. Transfer cooked falafel to a paper towel-lined plate using a slotted spoon; season with salt. Cool falafel to room temperature; break into pieces. Whisk sour cream, milk, cucumber, parsley, and 1/8 teaspoon salt together in a bowl until dressing is smooth and creamy; refrigerate. Spread greens onto serving plates. 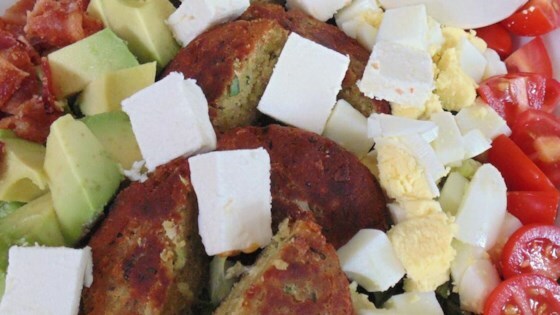 Arrange tomatoes, avocado, bacon, eggs, feta cheese, and falafel in rows over the greens. Drizzle dressing over each salad. Spinach or iceberg lettuce can also be used in place of mixed greens if desired.